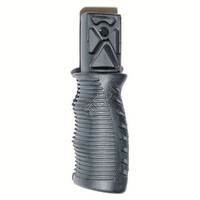 Upgrading the grip of your Tippmann 98 can be done to achieve a couple of different goals. First of all grips can improve the comfort of your gun. Also they can give it a unique look, weather that is through a magazine look, or just changing to more realistic wooden grips. Another reason you may be looking to upgrade is to an expansion chamber. Expansion chambers should be used by any player who uses Co2 on their Tippmann 98. They work by giving your Co2 more time to expand, and delivering you 98 Co2 in its gas form, which improves accuracy and efficiency. To read more information about these products, visit their product pages, or click the links to the right under more information. A great feeling ergonomic front grip. Magazine upgrades can bring a much more realistic feel to your Tippmann 98. Since most Tippmann users enjoy mil-sim style play, having your gun look realistic is definitely an eye catcher on the field. While these guns won't turn your marker into a magfed gun like this adapter kit would it will certainly improve your markers looks. We sell a few different grip upgrades for your Tippmann 98 Custom. We currently offer a kit that includes both the foregrip and the trigger frame grips, all in wooden grips, giving you an authentic feel. We also have an upgraded rubber front grip, it was designed to be much more comfortable than the stock plastic foregrip. As previously stated, the expansion chambers are a must for anyone wanting to use a Co2 tank on their Tippmann marker. Your paintball marker runs off of Co2 gas, however when your tanks are filled they are filled with liquid Co2. Expansion chambers allow more time (within the chambers) for the Co2 to change from its liquid state. to its gas form. If you have ever shot your marker and noticed that excess Co2 is shooting out of the barrel, it kind of looks like snow, that is liquid Co2 being shot out. When your marker is shooting liquid Co2 your air efficiency and accuracy will be suffering. Expansion chambers reduce the amount of liquid Co2 that enters the marker.